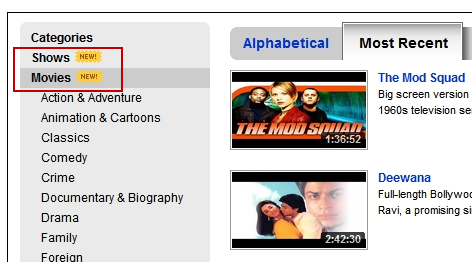 You can now find and watch full length movies and TV shows on YouTube easily. Most of the big and small media companies have now joined the YouTube partner program where they upload all their content (read full length movies and TV shows) on YouTube to generate revenue from online advertising. As announced recently by YouTube, companies like MGM, CBS, Lionsgate, Starz, Crackle etc. have uploaded all their content on YouTube. You can watch full length movies on YouTube at: www.youtube.com/movies. You can watch full length TV shows on YouTube at: www.youtube.com/shows. Note that some of the full length movies and TV shows are only available for US viewers, while some others are also restricted geographically. However you can still watch those videos by getting a US IP address or by using a proxy server. Another important thing to note here is that sometimes the geographically restricted movies and TV shows on YouTube will not be displayed to you if you go to the official links above. To overcome that restriction, just use the YouTube search box and try to find the desired movie or TV show and then use the proxy or a VPN server to watch it. You should avoid opening any of these unofficial links as they are unauthorized uploads. They will not only harm the movie and TV industry in the long run, but they will also redirect you to malicious sites, installing malware on your computer to steal your personal and financial data. If you happen to click on any such video in YouTube or Google search results, then you should just report it to YouTube. Related: You can also legally watch full IIT and IISC lectures on YouTube.